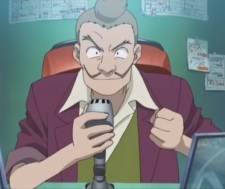 As the "voice of IGPX" announcer, Benjamin Bright (Tadashi Miyazawa, Tom Kenny) has become world famous for his color commentary on the sport. He slowly develops a grudging appreciation for the untested rookies of Team Satomi. Though only seen in person once (while introducing the teams in season 1), Bright can often be seen giving race commentary and IGPX news on the various public TV screens scattered around the city and on the trademark blimp that hovers above the track.